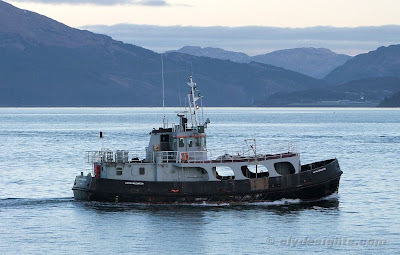 Passing McInroy's Point early on Thursday morning was the former Royal Navy tender LOYAL MEDIATOR. She dates from 1978, when she was built at Richard Dunston's yard at Thorne on the Humber as one of the 'Loyal' class of nine similar tenders operated by the Royal Naval Auxiliary Service. Following decommissioning, she has been employed as a commercial diving tender, and has spent considerable time based on the west coast of Scotland. In 2001 LOYAL MEDIATOR was instrumental in finding the wreck of a sunken British destroyer, HMS EXMOUTH, which had been torpedoed off Caithness in March 1940.